Rabastens's village is in the North of the department of high Pyrenees, region Noon - Pyrenees. This municipality is situated in the part is from the valley of Adour, at feet of a series of hillsides which separates it from the valley of nearby Arros. Numerous streams the crossbar among which Alaric and Estéous. The first one is a "artificial" canal which takes its source in Adour to Ordizan and extends over 60 km until Ju-Belloc in the Gers. 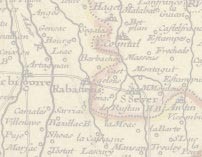 Estéous, as for him, begins to Souyeaux and covers 45 km until Labatut-Rivière. It is constituted by argilo-siliceous, very rocky lands, appropriate for the culture of the corn (which constitutes at present a quasi-monoculture). Hillsides are covered with wood and with some prairies. Latitude 43°22 ' N. Longitude 0°9 ' E.